Automatic and continuous air vent operation increases system efficiency. Many industrial processes involve the removal of air/gas from a pressurized liquid. Armstrong air vents are ideally suited for this purpose. The float-operated design means the vents can instantly and automatically adjust to variations in gas flow and pressure. The air vents can handle gas removal from liquids with specific gravities as low as 0.40 and pressure to 2,700 psi (186 bar). Armstrong air vents are available in a wide variety of sizes, end connections and construction materials. Air can accumulate in remote sections of chamber-type heat-transfer equipment such as jacketed kettles, retorts, vulcanizers and jacketed sterilizers. Armstrong offers thermostatic air vents for positive venting of air and other non-condensable gases in such equipment. Now you can literally see what you've been missing - the early warning signs of a system problem. Since you'll know the operating condition of the air vent, you won't have to waste time and money scheduling maintenance that isn't needed. In other words, you will be able to react to a condition before it becomes a problem. The Armstrong 1-AVCW see-thru air vent lets you easily check its operating condition, and you will be able to react to a condition before it becomes a problem. Positive seating: The free-floating valve mechanism ensures positive seating, so it prevents liquid loss. There are no fixed pivots to wear or create friction, and wear points are heavily reinforced for long life. Corrosion resistance: The long-lasting PBT (polybutylene terephthalate) cap provides trouble-free operation. Stainless steel internal parts resist corrosion and reduce maintenance. 21-AR - A small, economical air vent of high quality. It uses a single lever with a fixed pivot and viton seat, ensuring tight shutoff. 1-312 AR/VAR - Forged steel version of the Model 21 with a larger float and higher leverage. Available with screwed, socket weld or flanged connections. 1-AV - A cast iron air vent that uses a free-floating lever that closes positively, ensuring a leak-tight closing under all conditions. This vent is good for low capacity air/gas venting up to 300 psi (21 bar). 2-AV, 3-AV and 6-AV - These cast iron vents use the same proven free-floating lever mechanisms used in Armstrong steam traps. They are for applications where high air/gas venting capacity is required, up to 250 psi (17 bar). The Armstrong all-stainless steel guided lever air vents have been developed to provide positive venting of air/gases under pressure. The body and cap and all working parts of the No. 11-AV, 22-AV and 13-AV are made of high-strength, corrosion-resistant stainless steel. Body and caps are welded together to form a permanently sealed, tamperproof unit with no gaskets. Lever action is guided to ensure proper seating of the valve under all operating conditions. 32-AV, 33-AV and 36-AV are forged steel vents using the same proven free-floating lever mechanisms used in Armstrong steam traps. They are ideal for applications where high air/gas venting capacity is required, up to 1,000 psi (69 bar). They are available with screwed, socket weld or flanged connections. Armstrong developed the high-leverage series of air-relief traps especially for venting gases from low-specific- gravity fluids at high pressures. They use standard Armstrong forged steel bodies with very high leverage air-relief mechanisms. They are available with screwed, socketweld or flanged connections. Sour gas service: Forged steel and stainless steel traps can be modified to resist hydrogen sulfide stress corrosion. These modifications involve annealing the float, which will reduce the maximum working pressure of the float to about half its normal value. Armstrong offers thermostatic air vents for positive venting of air and other non-condensable gases from steam in chamber-type heat-transfer equipment. Typical applications include jacketed kettles, retorts, vulcanizers, jacketed sterilizers or other contained equipment where air could accumulate in remote areas of the steam chamber and reduce heat-transfer capacity. These vents are balanced pressure air vents that respond to the pressure-temperature curve of steam. Air is automatically vented at slightly below steam temperature throughout the entire operating pressure range. The Armstrong TAVB is a combination thermostatic air vent/vacuum breaker that is ideally suited for steam-filled vessels with modulating controls. The TAVB will vent air and other non-condensables from vessels such as shell-and-tube heat exchangers, jacketed kettles, and steam coils during their operation. It will also break the vacuum that forms during steam control modulation. This balanced pressure air vent responds to the pressure-temperature curve of steam, and the soft-seated vacuum breaker responds to 2" H2O (0,0051 bar) of vacuum. Armstrong offers the Model TV-2 balanced-pressure thermostatic air vent for positive venting of air from chamber-type heat-transfer equipment with no loss of steam. Typical applications include jacketed kettles, retorts, vulcanizers, jacketed sterilizers or other contained equipment where air could accumulate at the top of the steam chamber and reduce heat-transfer capacity. The Armstrong TS thermostatic air vent is offered in both angle and straight patterns. The TS-2 has a balanced-pressure thermostatic element with a multiple-convolution bellows of high quality. The TS-2 is ideal for venting air from such equipment as steam radiators and convectors, small heat exchangers, and unit heaters. The TS-2 comes with a cast bronze body and a stainless steel seat. The valve and seat are renewable in-line. The SV-12 Series has a vent port size for every room location, with the largest size for the coldest rooms and the smallest size for the "too hot" rooms. SV-12 air vents are easy to install on any steam radiator. 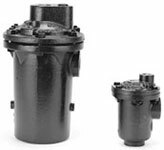 Air vent models AV-11 and AV-13 are compact float-type valves for the removal of air and other gases from hydronic heating and cooling systems, liquid chilling operations, and other light liquid services.